Wigan made it a memorable Easter period with a convincing 15-try demolition of bottom club Bradford Bulls. 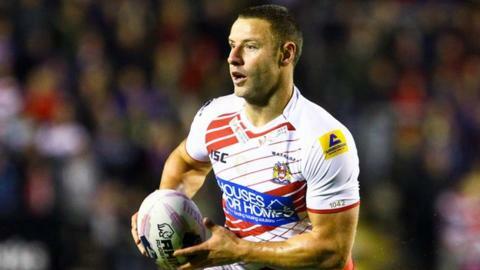 The Super League champions made it two wins in three days following their Good Friday victory over St Helens with another dominating display. Ryan Hampshire collected a personal tally of 24 points as Wigan touched down eight times in the first period. The Warriors ran in a further seven tries in the second half, condemning Bradford to their heaviest defeat. Wigan have equalled their all-time record Super League win. The Warriors beat Hull KR 84-6 in April 2013. The home-side took just five minutes to open the scoring with Blake Green going over from close range before Gelling grabbed Wigan's second following good work from Green and Sean O'Loughlin. The Warriors captain then touched down under the posts and Hampshire's conversion gave them a commanding lead with just 15 minutes gone. Wigan's fourth try came when Hampshire went through a massive gap in the Bulls' defence, and he grabbed a second moments later when Liam Farrell broke the first line of defence to put him away. Further tries from Farrell, Jack Hughes and Sam Powell took the match well and truly beyond the Bulls before they had even reached the interval. Bradford Bulls hold the record for the biggest Super League victory. They beat Salford 96-16 in June 2000. Hampshire continued to cause problems for the Bradford defence after the break and he put former Bulls' second row John Bateman in for Warriors' ninth try, Williams adding the extras this time. Goulding then backed up a good passing move involving Green and Bateman, before Green went 50 metres for his second try and Williams made it 62-0 with half an hour still left to play. Wigan's 12th try came as Hampshire again coasted through Bulls' poor defence before sending a ball back inside for Williams to go in under the posts. Wigan managed further tries from Gelling, Manfredi and Dudson, although the travelling Bradford fans finally had something to shout about in the 67th minute when Luke Gale stepped his way over for their first and only try of the game. Bulls remain in negative figures at the bottom of the Super League table, with only two wins from 10 games. "The one training session we had they were really intense and focused and I knew we would perform today. The way they had a swim in the morning, they all had their game-face on and I could tell they were in the mood. "Their attitude really impressed me over this Easter period. I wanted the manner to be good. "After 20 minutes we had completed at 100 per cent and we were defending really well. After a good win on Friday with such a short turnaround I thought it was really impressive and it was a fantastic win for us. Some of the tries we scored were outstanding." "I put it down to Wigan being miles better than us. I can look at people who we have missing, we have seven missing and a couple of part-time players but I thought some of our boys had a real dig but we were probably way off. "At times it looked like we had almost given in, that wasn't the case but it did look it and you can't play half a team that are not quite there against a team like Wigan." Wigan Warriors: Bateman, Burgess, Clubb, Dudson, L. Farrell, C. Farrell, Gelling, Goulding, Hampshire, Hughes, James, McIlorum, O'Loughlin, Powell, Sarginson, Smith, Sutton, Taylor, Williams. Bradford Bulls: Addy, Bates, Bridge, Brook, Conroy, Fakir, Gale, Gaskell, Henry, Kear, Kearney, Manuokafoa, Mellor, O'Brien, Olbison, Purtell, Roberts, Walker, Wood.